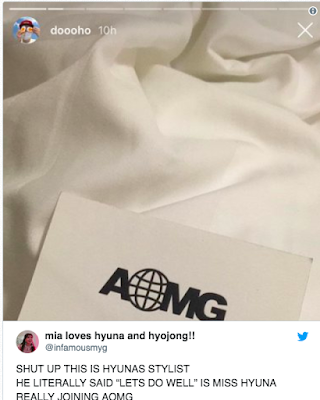 HYUNA FIRMA CON LA AGENCIA AOMG!!!??? TODO PARECE INDICAR QUE LA CANTANTE HYUNA EX INTEGRANTE DE 4MINUTE ACABA DE FIRMAR CON LA AGENCIA AOMG. HASTA HACE POCO SE ANUNCIABA QUE HYUNA ESTABA FUERA DE CUBE ENTERTAINMENT JUNTO CON SU ACTUAL PAREJA E´DAWN, AL SER DESPEDIDA DESPUÉS DE QUE DIERA A CONOCER SU RELACIÓN CON EL TODAVÍA INTEGRANTE DEL GRUPO DE KPOP PENTAGON. AOMG ES LA AGENCIA DEL CANTANTE Y RAPERO JAY PARK, EX INTEFRANTE DEL GRUPO DE KPOP 2 PM, DE LA CUAL ES FUNDADOR Y DUEÑO, EN LA AGENCIA SE ENCUENTRAN CANTANTES DE RAP COMO LOCO, GRAY, SIMON D, CHA CHA MALONE, ENTRE OTROS, SU AGENCIA ES MUY CONOCIDA Y DE RECONOMIENTO MUNDIAL. ACTUALMENTE EN EL INSTAGRAM DE JAY PARK HAY MUCHOS COMENTARIOS ACERCA DE ESTA UNIÓN, AUNQUE HASTA EL MOMENTO CUBE ENTERTAINMENT NO HA PRONUNCIADO NADA OFICIAL AÚN. ASÍ MISMO EL MANAGER DE HYUNA DEJO DE SEGUIR A LA EMPRESA CUBE ENTERTAINT Y SU ESTILISTA SUBIÓ UNA FOTO DE AOMG Y FELICITANDO Y EXTRAÑANDO A HYUNA. HASTA EL MOMENTO NADA ES OFICIAL ESTAMOS ESPERANDO CONFIRMACIÓN Y MÁS INFORMACIÓN ACERCA DE ESTO.